Dreams of hoisting a state title turned to reality for Truckee’s baseball team at last weekend’s Class 3A state championship tournament. “That’s been us all year. They have so much fight. They never give up,” said coach Jeff Murphy. With a knack for piling on runs with two outs and a propensity for clutch hitting, fans of Truckee began calling the team the “2 Out Nightmare.” The team lived up to that moniker time and again during its run to the program’s first title since 2012. With a field still covered in snow, Truckee was forced indoors for its first practices of the season. With four seniors on the team and coming off an 8-20 season, expectations weren’t exactly high for a program that hadn’t finished with a winning record since 2012. A 27-4 loss to Class 4A Reno to open the year didn’t buoy hopes for a winning campaign, but things were beginning to change in Murphy’s fourth year at the helm. 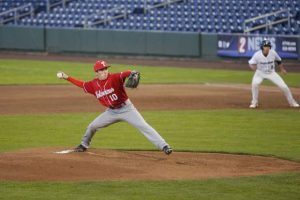 “Hitting is coming around, it’s not where we want yet, but we definitely have a good, optimistic outlook of what we could do,” Murphy said after the first week of play, in which the team went 4-1. Truckee would stumble to open league play, falling 8-3 against Dayton in the opener, but then rattled off six straight victories, sending a message to the rest of the teams in the Class 3A Northern League. Seniors Just, Joel Estabrook, Tyler Ferrera, and Gary Grosjean each played key roles in guiding the team to a 16-8 record and third-place finish in the Northern League. Grosjean, Estabrook, and Just shouldered the majority of the work from the hill, combining to pitch 77 percent of the team’s innings this season. From the plate a group of juniors and a sophomore played keyed roles in Truckee’s run this season. Sophomore Tyler Estabrook led Truckee with 54 hits and finished the season with a .452 batting average. Junior Derek LaFerriere was next with 60 hits, a .484 batting average, and a team-high 14 doubles, followed by junior Spencer Edmondson with 52 hits and team-leading 39 RBIs. 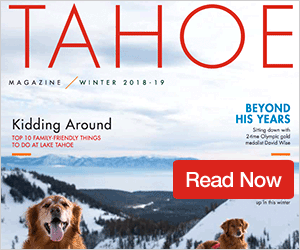 By season’s end, the infusion of a solid junior class and Truckee’s four seniors catapulted the team from the bottom of the division into the Class 3 Northern League tournament for the first time in five seasons. Truckee entered the Northern League tournament as the No. 3 seed and stormed past Spring Creek in a 6-3 victory to open play in Fallon. The Wolverines then played tournament host, Churchill County, and got one of the best performances of the season from Joel Estabrook. The senior one-hit the Greenwave to send Truckee to a 3-2 victory. Estabrook walked three batters and allowed a single to begin the game, but from that point on, locked down the opposing batters. Truckee then faced Elko with a chance to earn a state berth, but were turned away, falling 6-2. 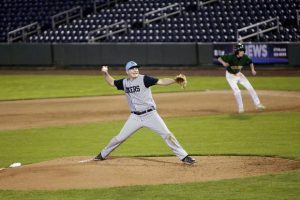 The Wolverines would respond with a 6-4 win over rivals South Tahoe in an elimination game, clinching a spot in the state tournament for the first time since 2013. Truckee finished the tournament with a 5-4 loss to Elko, as the Indians captured the league championship off a walk-off hit to right field. 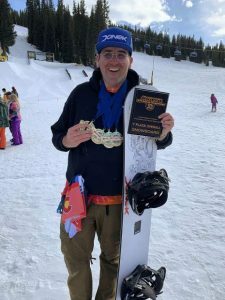 Truckee opened the state tournament on Thursday, May 17, as the No. 2 seed from the Northern League, and was matched up against the two-time defending state champions Boulder City. Murphy gave Grosjean the start, and the senior hurler delivered a solid performance against a dangerous Eagles lineup, limiting the team to four runs through six innings of work. Grosjean came out to start the seventh. After getting an out with a runner on base, he reached his pitch count, forcing Murphy to go to his bullpen. Junior Jake Streit got the call and made two throws to end the game. Streit got a groundball hit back to him on his first pitch, and then fielded the ball, and fired to Tyler Estabrook for the out at second, who then swung the ball to first for the game-ending double play. Fans of the Wolverines showed up to the game clad in “2 Out Nightmare” shirts and chants rained down from the bleachers each time the Wolverines threatened to score on their final out of an inning. Truckee further cemented the moniker the following day against Elko, scoring seven of its eight runs with two outs to defeat the Indians 8-4. Joel Estabrook got the call and put together another terrific postseason performance with a four-hit, complete game effort. The senior allowed one earned run and struck out three batters. Just led the team from the plate with a trio of RBIs, including a key two-run single with two outs in the fourth inning to give Truckee a 6-3 lead. “I was just sitting fastball and he gave me a fastball,” said Just. The win moved Truckee to within a win of winning the four-team, double elimination state tournament, but the team would have to go through a familiar rival in order to take this year’s championship. Elko would rebound from its loss to Truckee with a win against Pahrump to set up a rematch. The Wolverines would need to win one game, while the Indians would have to defeat Truckee twice. Elko opened with four runs in the top of the third to hold an early advantage. Truckee junior Marcus Bellon brought the Wolverines to within three runs, finding open field on a fly ball in the bottom of the frame to make the score 4-1. After allowing a leadoff double to start the next inning, starting pitcher Just got a grounder for an out and then struck out the next two batters. With two outs and a pair of runners on in the bottom of the frame, Ferrera came to the plate and singled to score a run. Sophomore Tyler Estabrook then found a gap in right field for two more runs, knotting the game at 4-4. Just got into trouble in the next inning with runners on second and third, and two outs. The senior looked to be on the verge of avoiding danger, but an error allowed both runs to score, putting Truckee in a 6-4 hole. Just would go on to help his own cause with a big hit in the bottom of the frame, smacking a two-out double to make the score 6-5. 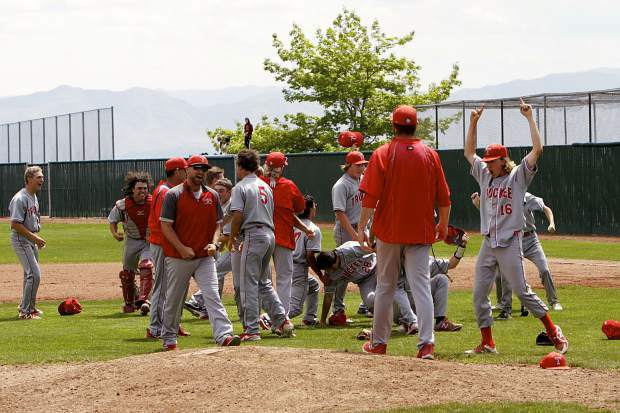 Going into the bottom of the sixth, rumblings of a state championship began to reverberate along the Truckee bench. LaFerriere went on to knock in the game-tying run later in the inning. Junior Elliot Rost later stepped to plate — with two outs — in one of the biggest at-bats of the season. Rost’s shot to center field plated all three baserunners, giving Truckee a 9-6 lead. Ferrera then came to the plate and drove another ball to the outfield for a 10-6 advantage. Just returned to the mound in the top of the seventh in a bid finish off Elko, but hit his pitch limit with a runner on and two outs. The senior was moved to first base, but still squeezed the final out off of a grounder forced by Grosjean, giving Truckee a 10-6 victory and a state championship. The performance capped off a magical run for the “2 Out Nightmare” as the team captured the program’s first state title in six years behind eight, two-out runs against Elko. Justin Scacco is a reporter for the Truckee Sun. Contact him at jscacco@sierrasun.com.